— Is there unused space under a staircase or in the back of a deep closet where custom storage could be created? Take measurements at your new home to determine which items you’ll move and which need to be sold or donated. Keep in mind that large pieces in a large house are going to look even larger when moved into a smaller space. Let family and friends know you’re moving. If there are items you no longer need, want or can use, you may discover a friend or relative has always admired a furniture or decor item and would be thrilled to have it in their home. Schedule a garage sale. Price the items to sell – don’t let your emotional attachment put too high a price on an item because at the end of the day it will still be in your garage. Sell items on Craigslist, Facebook Marketplace, OfferUp, eBay, etc. Donate usable items to local charities. Service organizations need kitchen utensils, bedding, furniture, etc. to set up housing for families in transition. Many will pick up large items but need advance notice to schedule trucks. 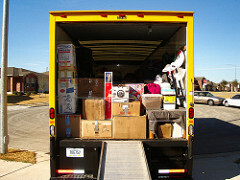 Once you’ve gotten through the process you may find downsizing is very liberating. There’s a lot of physical and emotional freedom that comes from letting go of old possessions that once were very useful but now are just taking up space. There’s less upkeep in a smaller space as well, so more time to spend with family and friends, exploring your new neighborhood or traveling. It can be a refreshing to maintain your old routines but in a new neighborhood where you can discover new friends, places and opportunities.